Russian Space Dogs « Adafruit Industries – Makers, hackers, artists, designers and engineers! Laika and Her Comrades: The Soviet Space Dogs Who Took Giant Leaps for Mankind | Collectors Weekly. 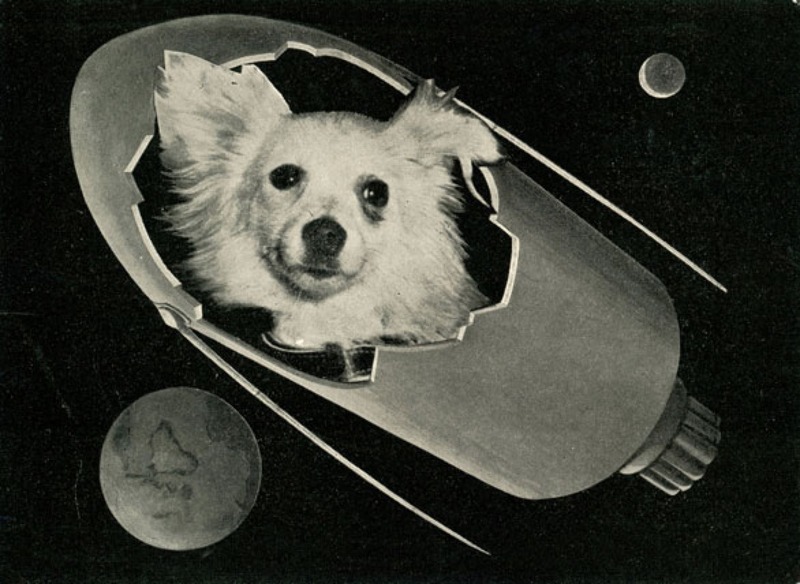 …some Soviet space dogs survived and went on to live relatively normal lives. The next mutts launched into orbit—Belka and Strelka—landed safely, and became beloved pop stars at a time when the USSR frowned on celebrating individual achievements. Laika, Belka, Strelka, and other publicized dog cosmonauts symbolized the ultimate Soviet heroism, seen as simple creatures laying down their lives for their country and the advancement of science. Everything from stamps and postal covers to toys, children’s books, cigarette packages, and candy tins featured these furry icons. Many years ago I was on the first satellite tracking team at Harvard Observatory (“Moon Watch”). On one night we had lost the satellite that carried Laika. It just wasn’t in the sky where our calculations said it should be. To help find it, we enlisted the general public by putting announcements on the local radio stations. Early the next morning during an observation session we received a phone call from an, obviously elderly lady who claimed to have found it. Her answers to to our questions were far ore technical than we were expecting from the general public. She knew her exact latitude and longitude, the exact time of the observation and a perfect description of the star field that the satellite appeared to fly through. We were ecstatic. With her observation we could find the satellite. As were thanking her and going to hang up she added that with her binoculars could see Laika looking out the satellite window and Laika looked very happy. We thank her very much and didn’t mention what was going to happen to the poor dog. We did find the satellite the next night with her notes that she gave us. Did she really see the dog???? Not one of the astronomers believed her observation about the dog but were astounded with her finding the missing satellite.